Preheat oven to 425°F. Place the bread on a baking sheet and drizzle with the oil. Place the bread in the oven and cook for 3-5 minutes, or to desired crispness. 2. For the chicken, add the oil and seasonings and set aside. Heat a grill, Panini press, or skillet over medium high heat. Cook for 3-4 minutes per side or until the chicken is cooked through. 3. 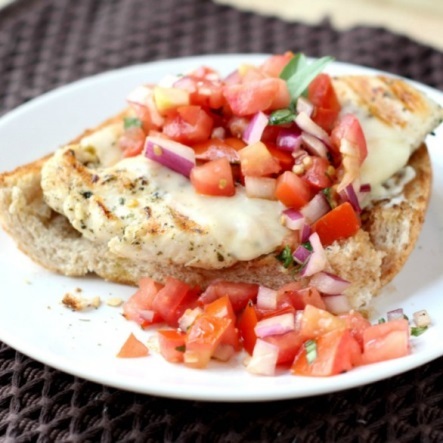 While the chicken and bread are cooking, assemble the bruschetta by combining the tomatoes, onion, garlic, oil, balsamic vinegar, and basil in a bowl. Mix well. 4. To assemble the sandwiches, top each slice of bread with 1-2 chicken cutlets (depending on size), then place a slice of cheese over the chicken. Just before serving, top each sandwich with the bruschetta.